Just enough time for lunch before my next appointment and I know exactly where to go - Restorante Pizzeria Da Gemma! They have a linguini with Frutti di mare called "As you like it" that is the best I have ever had! This afternoon I am off to see Villa Sereni in Sorrento. Sorrento is a good 30 minutes drive by car and 30 minutes by ferry. However, the ferries have stopped running to the coastal ports as of October, so I arranged for a taxi. This guy was great! I would never have found this villa without him. The location is just outside the city (a residential area), but still close enough to take advantage of the fine restaurants and shopping. 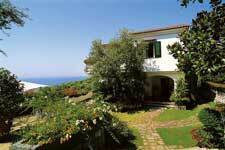 The villa sits high up on the coastal hillside and enjoys fabulous sea views out over the Bay of Naples. The estate is quite large with a huge gate at the entrance, then a long driveway to the villa. We arrived in the middle of the most ferocious thunder and lightning storm. It was almost pitch black outside and the rain was torrential. This villa is VERY ELEGANT. Every room is perfect. 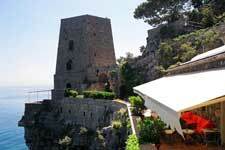 The following day I am scheduled to see Villa Torre Di Positano. The villa is located just to the right of Positano Beach and just to the right of Fornillo Beach. The villa can only be reached by boat or by the walkway across Fornillo Beach. When guest arrive they are met on the beach and transferred along with their luggage to the villa by boat. This transportation can be arranged as often as the clients wish or they can simply walk into town via the walkway. The villa is very old and has quite a history. A good portion of the villa is built into the rock. The views are amazing! There is also a small private beach to the right of the villa which has NO public access. Villa Amalfitana is my next stop. The villa is located between Amalfi and Positano, just off the main coastal road. There is a staircase nearby (400 steps) that leads down to a really nice beach where Clients can walk up to Amalfi. A good Amalfi beach house! After the visit to Amalfitana, Antoinetta took me to lunch at this cute local trattoria in downtown Amalfi. I have never actually been in the town of Amalfi before. It is very picturesque and there is a great Cathedral in the center that is magnificent! We enjoyed some local pasta for lunch that was very simple yet outrageously good! I wound up my trip on Saturday, by taking the train back to Rome from Naples airport and from there back to the Condotti Hotel. I am exhausted but very happy. It's been a lovely trip! Just missed the traveling team of Liz, Bob, Lidy and Bethany. As they were going out to dinner, I was going to bed. So Ciao everyone, enjoy!